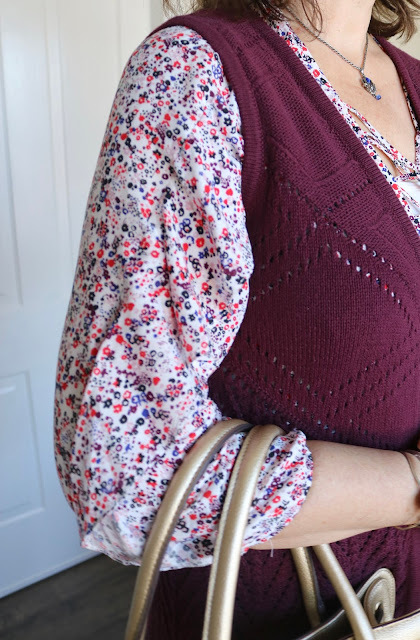 Now that the weather has warmed up just a tad, and I mean just a TAD (forty or fifty degrees) I can wear my long cardigans again. I find dusters so difficult to wear in the winter because they hang down longer than any coat. They work best for me for the "in-between seasons": spring and fall. It is still too muddy, brown, and down right ugly outside to take photos in my yard, so I decided to try photographing in my new guest room. It's still not done...I'm looking for wall paintings, lamps, an area rug, bench, and laundry basket. Hubby is busy making the end tables as we couldn't find any we liked in the stores or on-line. However, it is coming together beautifully and you will definitely get a sneak peak of the room in this post. If you missed any of the guest room remodel posts you can find them HERE and HERE. I bought this burgundy sleeveless knit duster from CJBanks (sold out). I liked it so much as an extra layering piece that I bought an identical one in black. I already showed the black one before in THIS POST. I wore this outfit out to breakfast at Buttermilk when I was visiting my children in Illinois and also to church back at home. 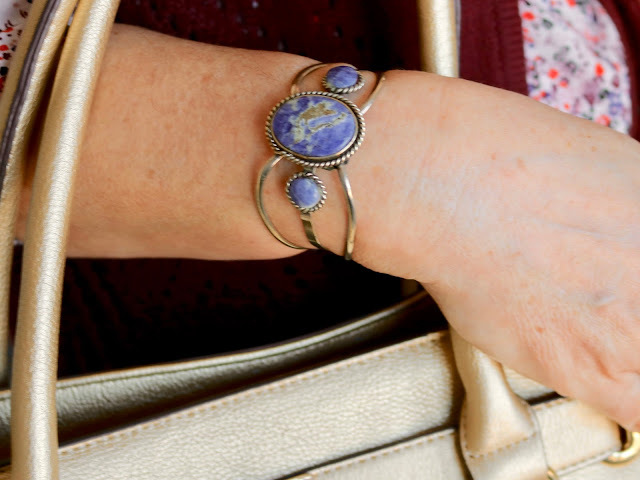 When I wore it out to breakfast, it was a cold, chilly day so I added a navy blue scarf. 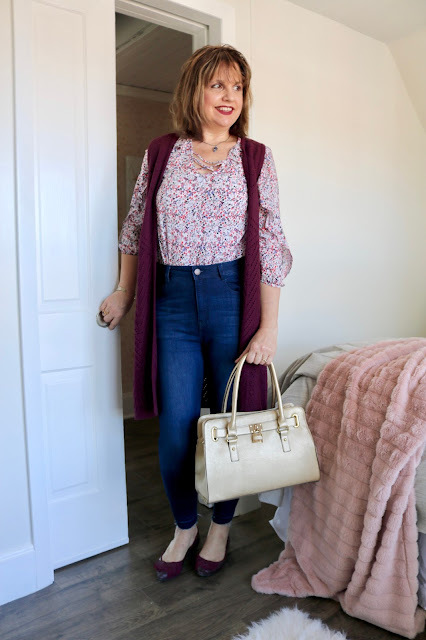 I paired the vest with my new Refuge Hi-Rise frayed hem skinny jeans from Charlotte Russe and my new a.n.a 3/4 sleeve Round Floral Lace Up Ruffle Blouse from JCP. I last showed you this top in a Grandma & Me post. Because the weather warmed up, I can toss aside the boots and bring out the flats. I just have to watch out for puddles as the snow is still melting. This is a burgundy pair with a pointy toe and pretty ribbon that I picked up at Express years ago. 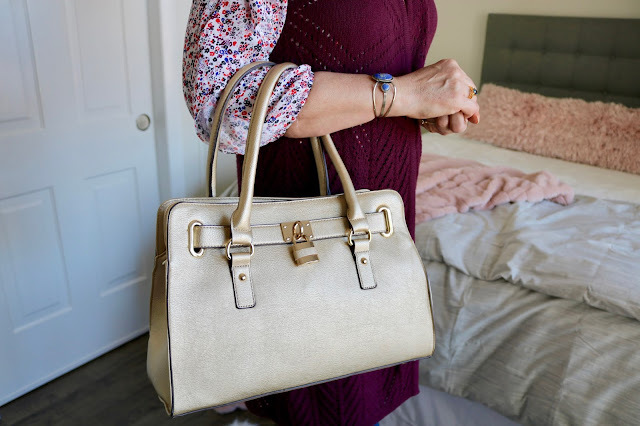 I carried a metallic gold bag which was a gift from my daughter. For jewelry, I picked out some blue and silver pieces from my collection to pull out the color blue in the top. The top has a couple of unique details: there is a ruffle running all the way up the sleeve up to the neckline (hard to see in the photo, but quite noticeable in real life) and the chest has criss cross straps. Long dusters really elongate and slim the figure! If you want to look trimmer and leaner, I definitely recommend trying one of these. Another winning outfit. But Amy, brrrr, you've abandoned the boots?!! I haven't, it's still far too cold. Thanks for the sneaky room preview, it's looking pretty darn perfect already! haha! Truth be told, you caught me! I took the pictures the day before I wore the outfit. I changed into black booties when I actually wore this look. I wanted to wear the burgundy flats though! 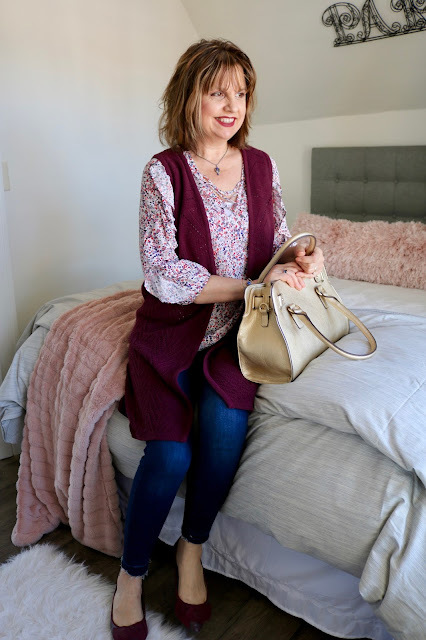 I adore the color of this duster, and I hope the weather stays warm! That duster is so cute! This is the perfect way to still stay warm, since winter seems to not want to let go lately! Thanks Shauna, I know right? I just heard the east coast is getting their 4th snowstorm with up to 12 inches of snow! Yikes! 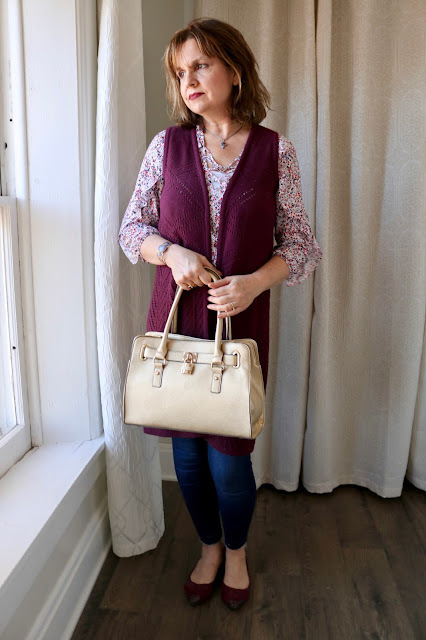 This vest makes for a great layering piece, girlfriend! 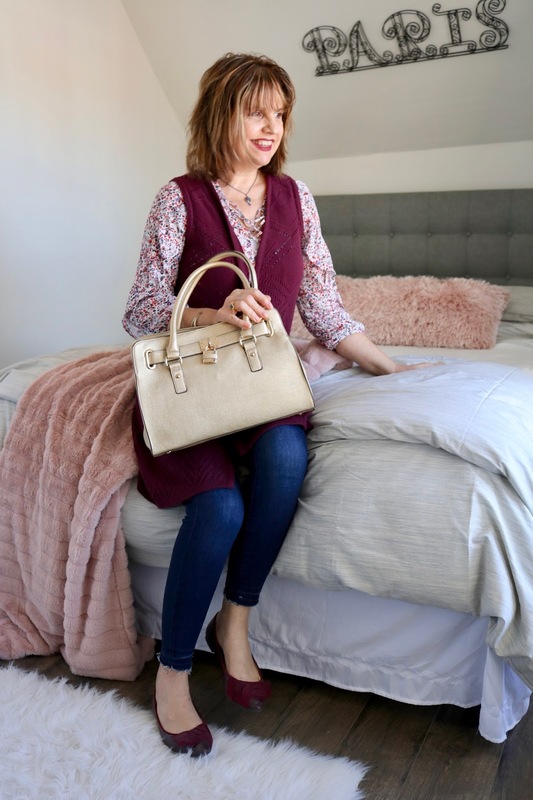 Love how your guest room is turning out! 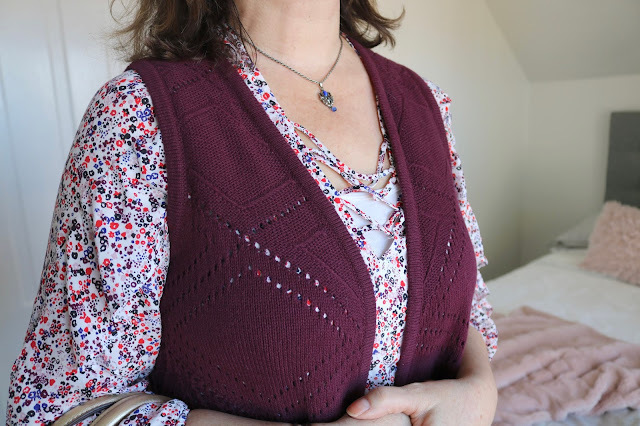 That long burgundy vest is fabulous! Thanks Laura! Hopefully I'll be able to do a big reveal post soon! The duster looks so nice on you! I'm so short I have a hard time with long things because they are extra long on me! Thank you, this vest is super long so I doubt it would work well on a petite frame. I'm 5'7 and I think it's long on me. I love your long duster vest. 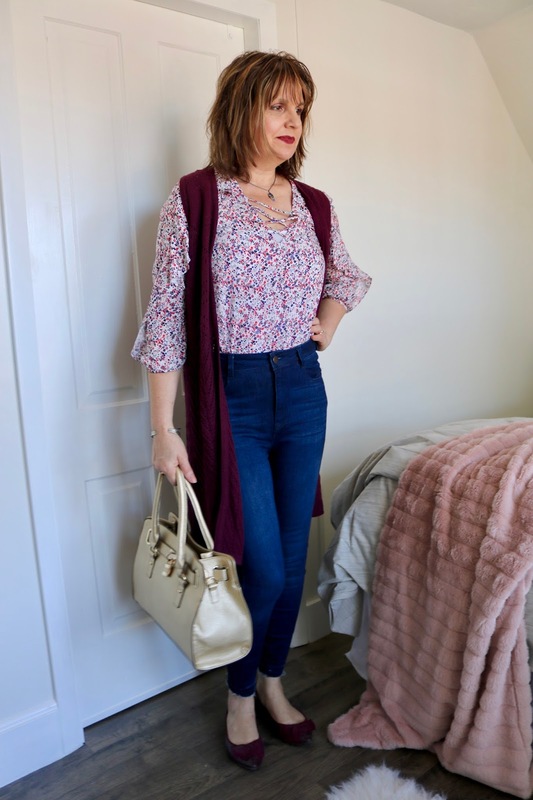 It's such a great option for spring without it being too wintery! Thank you! It is so hard dressing during these transitional seasons. The calendar says spring but the weather says winter. Nice look, love that burgundy and how well your shoes match the vest! Looking forward to cardigan and thin jacket weather as well...the only time I can wear mine in winter is inside, and they do come in handy for a little extra warmth in winter. Thanks Elli, I agree! I usually just wear cardigans indoors as well. Easy on/easy off if I get too cold or hot indoors. 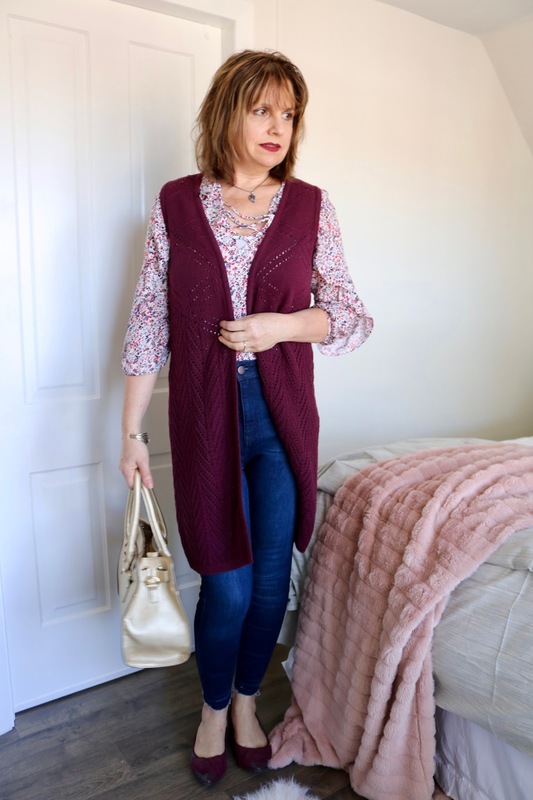 Love the vest, fab colour! Thanks for linking up!